Chicken Sotanghon Soup is a Filipino version of chicken noodle soup. 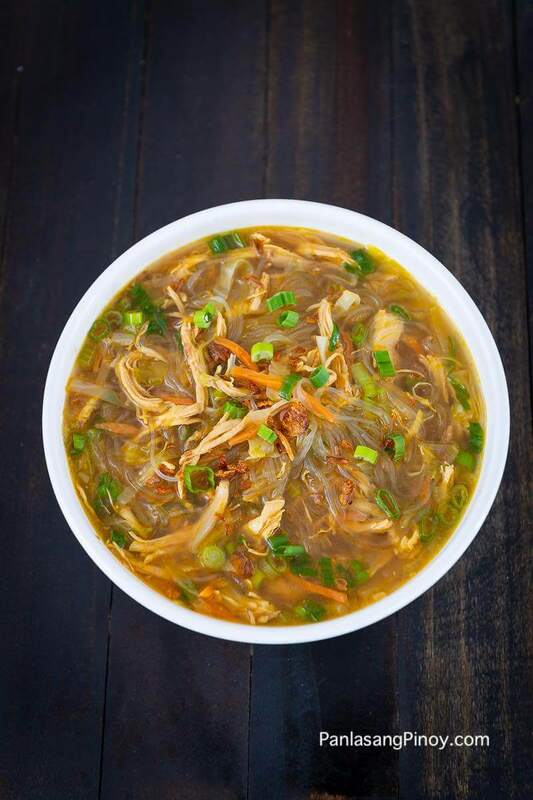 This soup dish makes use of shredded chicken and sotanghon noodles. It also has carrots and cabbage. Adding roasted garlic, scallions, and seasoning with fish sauce makes it stand out. I like to have Chicken Sotanghon Soup anytime of the day regardless of the season. It always makes me feel comfortable. I usually have it as a mid-afternoon snack, but there are times when I crave for it early in the morning. Sometimes, I eat this as a meal for lunch with rice. This Pinoy chicken noodle soup version is easy to make. It can take less than 20 minutes to cook provided that the ingredients are prepared ahead of time. The chicken needs to be prepped in this recipe. This is the reason why it took a bit longer. Start by making annatto water. Combine annatto seeds with warm water and then stir. Soak for 10 minutes. Filter the seeds using a kitchen sieve and set the colored water aside. We need shredded chicken for this recipe. Chicken needs to be cooked thoroughly and then shredded afterwards. Start by boiling water in a cooking pot. Add a piece of dried bay leaf for extra aroma. Put chicken in the pot and boil for 20 minutes. Remove chicken and let it cool down before manually shredding the meat. I suggest removing the skin, unless you want it in your soup. Save the chicken stock. It is needed for the soup. The actual cooking process is straightforward after preparing the ingredients. This involves sautéing the aromatics such as garlic, onion, and celery. Make sure to brown the garlic in order to get that nice roasted garlic flavor in your soup. Add the shredded chicken and saute for a couple of minutes before pouring the stock. Chicken Sotanghon Soup should be tasty. Adding a piece of Knorr Chicken Cube provides that solid chicken flavor. I like my soup to be somewhat orangey in color. Annato water does this for me. Add the sotanghon noodles and cook for approximately 10 minutes. This soup is sufficient enough with only carrots and cabbage as vegetable ingredients. However, feel free to add other veggies if desired. Put the veggies in the pot and cook for a few minutes before seasoning with patis and ground black pepper. I also add roasted garlic and chopped scallions. These makes a huge difference. Try this Chicken Noodle Soup Recipe. Let me know what you think. A Filipino version of chicken noodle soup. This dish is composed of shredded chicken breast and vermicelli with carrots and cabbage. Prepare the chicken by boiling water ina cooking pot. Add bay leaf. Put the chicken breast in the pot. Cover and boil in medium heat for 20 minutes. Remove chicken from the pot and put in a clean plate. Let it cool down. Save the chicken stock. Shred the chicken and set aside. Heat oil in a large pot. Saute garlic until light brown. Add onion and celery. Saute until onion softens. Put the shredded chicken in the pot and then saute for 2 minutes. Pour chicken stock and let boil. Add Knorr Chicken Cube. Stir. Add annatto water and sotanghon noodles. Cover and cook for 10 minutes. Put carrots and cabbage into the pot. Cook for 5 minutes. Season with fish sauce and ground black pepper. Put some roasted garlic and chopped scallions. Stir. Transfer to a serving bowl. Serve. Share and enjoy! the recipe looks good :-)… just want to know what is anato? thanks…. thanks for your great recipes…pwd po ba malaman gaano po kadami ung annato seeds to make the annato water…keep up the good work! hello po..ano po pwd alternative sa annato water kung hindi available? do we have annato water po ba sa safeway? i dont have idea what this is. please reply… thanks. My mom calls Annato “achuete”. It’s the tiny red seed looking things that when you soak them in water, the water turns a reddish color. You can find this in the Hispanic section at Safeway labeled “Achiote” most likely it’s already grounded into a powder. If it is, you can still mix a little powder with water and get the same effect. I’m cooking this for supper. Thank you very much, Chef! You make my life easy!